In 1881 Charles Darwin wrote: “It may be doubted whether there are many other animals which have played so important a part in the history of the world, as have these lowly organized creatures”. Charles Darwin was one of the first to tell about the value of earthworms to soil. He estimated that the earthworm castings on an average acre could provide 1/5 inch of new surface soil per year. 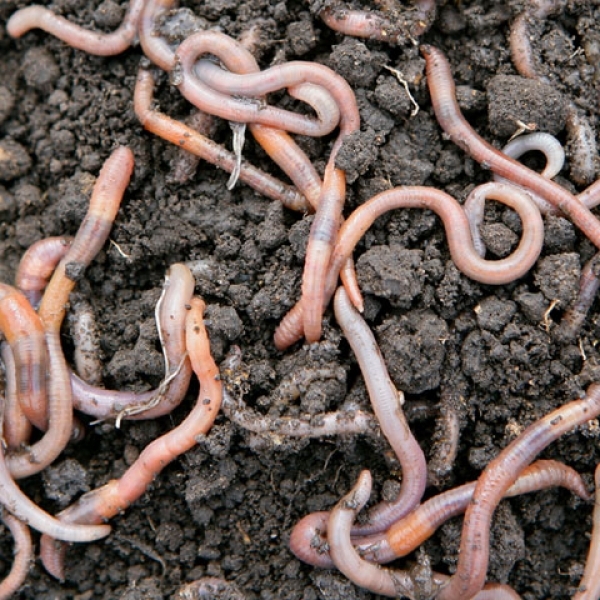 An acre of good garden or farm soil may be home to a million earthworms. There are hundreds of thousands of species of worms and about 2,700 are earth worms. Earth worms have been around for 120 million years! That’s quite a long time, they were even around when the dinosaurs were here! Did you know that a ton of worms can eat a ton of greens, kitchen and paper wastes in 1 – 4 days! They basically can eat their own body weight in one day. If you think of archeologists when they dig up ancient bodies etc, there is usually nothing left except, bones, metal or stone objects, this is because the worms and other tiny life in the soil eat almost everything else! One of their favorite food is Poo! They just love horse manure, to them this is the same as us going for our favorite Chinese dinner! Worms come in all sorts of sizes from tiny little thin things to very big ones. The largest earthworm is the giant Gippsland, it lives in Australia and can grow to about 9 feet in length, it is a protected and endangered species as many have been killed by farming methods. 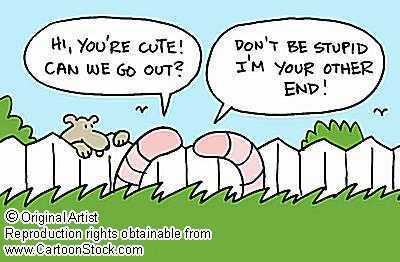 Worms are hermaphrodites, that is to say each worm is both male and female, but they can cross fertilize. Two worms will wriggle together, go all wet and slimy (a bit like humans) and both will produce an egg. The ring around the worm, about 1 third down from its head end is called the Clitellum, often referred to as the saddle. The saddle is where the worm eggs are made. After mating the clitellum forms a shell around the worm cells and “rolls” itself over the head of the worm making the egg capsule, called a Cocoon. Each worm will produce between 1 and 2 cocoons per week. Baby worms are not born. They hatch from cocoons smaller than a grain of rice. That looks like a lemon, Go figure! Each cocoon will contain between 1 and 7 hatchlings, always an odd number usually 3 or 5. Worms must like prime numbers! The eggs can lie dormant for up to a year, hatching only when the conditions are favorable. They like a temperature of between 15 and 22 degrees. When hatched the hatchlings are tiny, about 2mm in length and the with of a fine pencil line. The hatchlings develop and are fully sexually mature at about 16 weeks, this is when they develop their clitella and can start mating and producing eggs. Presto! New worms. Worms are invertebrates, that is they have a long, soft body and no back bone or legs! They do not have a brain but do have a nerve center (called a ganglia). They do not have eyes, ears, arms or legs but are sensitive to light and move very fast away from the light. That’s why they only come out of the ground at night. Mostly to find other worms and mate. At night worms often come to the surface and deposit mounds of castings (“worm poop”) small pellet-like piles of organic matter that have passed through the worms digestive tract. Worms either move by stretching and contracting their muscles or some only move using the movement of other creatures or the soil movement. To put it another way, worms get around. Worms are wonderful creatures. They don’t talk back, they don’t need much care, they cleanup after themselves and they provided the gardener with a plethora of benefits. Worms are so beneficial that we couldn’t live without them. Worms are good for gardens and farmland. By tunneling through soil, they drain water, bring in oxygen, and create space for plant roots. The Earthworms body is bristling with sense organs-as many as 1,900 on just one segment. These receptors give the worm a sense of touch, the capacity to taste, and the ability to detect light. They have light-sensitive cells that help them tell the difference between light and darkness. Their bodies are sensitive to vibrations and worms may “outrun” the shovels of anglers digging worms for fish bait. Fish LOVE a good worm and we should LOVE them too. 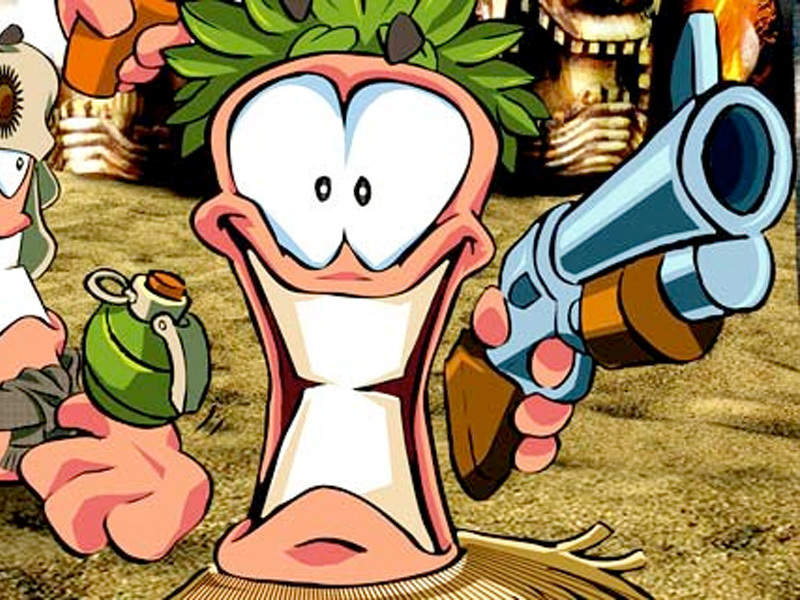 Worms have no fewer than 5 hearts! That’s a lot of LOVE from one worm. Earthworms don’t have lungs, but instead breathe through their skin as long as it stays moist. The slimy surface of the worm, actually allows the little creature to breathe. The worm’s skin is porous, and blood vessels close to the skin absorb oxygen from the air or from oxygenated water while releasing carbon dioxide. But these gases can interchange only if the skin is moist. If a worm dries out, it will slowly choke to death. On the other hand, if a worm is trapped in its burrow during heavy rain, the oxygen supply in the water will be quickly exhausted. This is one reason why worms crawl to the surface after a downpour. If they don’t evacuate, they will suffocate. There are approximately 2,700 different kinds of earthworms. Worms live where there is food, moisture, oxygen and a favorable temperature. If they don’t have these things, they go somewhere else. An earthworm can grow only so long. 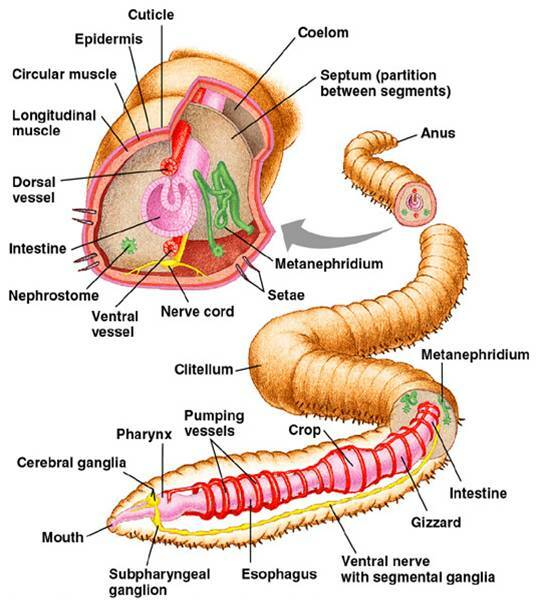 A well-fed adult will depend on what kind of worm it is, how many segments it has, how old it is and how well fed it is. An Lumbricus terrestris will be from 90-300 millimeters long. 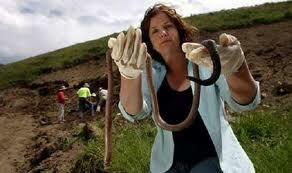 The largest earthworm ever found was in South Africa and measured 22 feet from its nose to the tip of its tail. One might consider this a snake, but it was a worm. Worms are cold-blooded animals. Earthworms have the ability to replace or replicate lost segments. This ability varies greatly depending on the species of worm, the amount of damage to the worm and where it is cut. It may be easy for a worm to replace a lost tail, but may be very difficult or impossible to replace a lost head if things are not just right. Now that’s a meal and a half. Kind of a Worm but not from around here. Maybe it’s an Alien Worm! As worms squirm through the earth’s surface, they act like miniature plowmen. 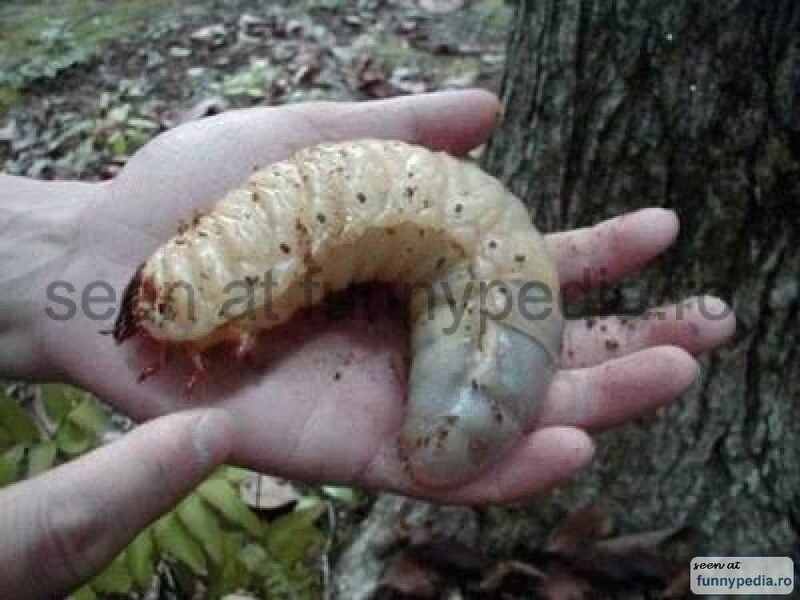 Munching their way through manure, soil, and decaying vegetation, they produce a waste product called worm castings-a product they manufacture in enormous quantities. It has been estimated that worms working under the green fields of England annually churn out about eight tons of castings per acre. That’s a lot of worm poo! More impressive are the worms that inhabit the Nile Valley. These worms may deposit up to 1,000 tons of castings per acre. Wow, that’s a lot more worm poo! As worms till the soil, it becomes better aerated and more water absorbent and increases in fertility. Earthworms pull partly decomposed organic material down into the soil for a good feast. The organic matter is then broken down further in the earthworm, before being excreted as ‘worm casts’. These are easily converted into nutrients by the soil’s micro-organisms. The nutrients are readily taken up by developing plants. Worm casts in the garden, have a nutrient level and organic matter level much higher than that of the surrounding soil. Each day worms produce nitrogen, phosphorous, potassium, calcium carbonate and many micro nutrients in a form that all plants can use. A small 400 sq ft garden with a low worm population of only 5 worms/cubic foot will be provided with over 600 lbs (about 1/3 lb per worm) of top-grade fertilizer by the worms, each year. They can also help to bring an acid soil back to a more neutral ph over time. Their casts contain calcium carbonate. Earthworms are generally found in the top 2 feet or so of soil. They breathe through their skin and therefore need a moist environment, so if the soil dries excessively, they will burrow deeper. (Up to 6 feet) They are basically nocturnal – coming to the surface at night when temperatures are lower and humidity higher. Sandy and acidic soils are their least favorite habitats. In addition to recycling organic matter, worms are great for improving soil structure. Their borrowing action helps to improve aeration, moisture retention, and water penetration. So, if you want more earthworms, apply regular dressings of organic matter to the top surface of your garden or worm farm. The worms will do the digging for you! See, I told you they were wonderful. The worm grips the soil with the aid of small, hairlike projections called setae. Each segment of the worm has sets of setae that act somewhat like the oars of a rowboat. The worm plunges them into the soil, pulls itself along, and then retracts them. The worm can “paddle” in either direction using one set of setae at a time or, if startled, can anchor one end of its body while rapidly retracting the other end. Boy, are they fast, I use to catch worms for fishing. It’s not that easy. But it sure was it fun! Vermicomposting is the practice of using worms to break down food scraps. The resulting material is a mix of worm castings and decomposed food scraps. The perfect compost for gardening and house plants. They also make a wonderful Tea. But, I wouldn’t drink it. However, plants LOVE the stuff and grow wild when given a good cup of tea. Humm, plants must LOVE tea too! Many gardeners compost both yard waste and kitchen waste with compost piles, sheet composting or some other method during the growing season. Fortunately, very little yard waste is generated during winter months when cold temperatures make composting difficult. However, usable kitchen waste is constantly being generated and must be disposed of. Vermicomposting is the process of using worms and micro-organisms to turn kitchen waste into a black, earthy-smelling, nutrient-rich humus. Perfect for gardening. Here are some suitable sources of bedding. The bedding for vermicomposting systems must be able to retain both moisture and air while providing a place for the worms to live. Bedding does not have to be purchased and most of us have plenty of bedding resources in our home, office or school. Think junk mail, it’s not junk to the worms, it’s home sweet home. Shredded corrugated cardboard is an excellent bedding, but at times it’s difficult to find. Shredded paper like newspaper and computer paper is easy to find, but may dry out quicker than corrugated cardboard. There is not a problem with the ink from the paper. Most are made from vegetable dyes. Peat moss has a low pH level that may cause a problem for the worms and it is more expensive. 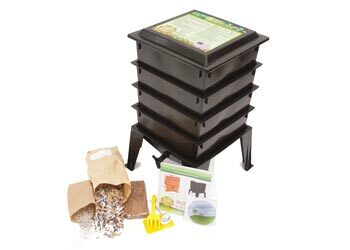 Commercial worm bedding is available in sporting goods stores, but it is also more expensive. The amount of bedding depends on the size of the box. A 2-by-2 foot box will need between 4 and 6 pounds of dry bedding, a 2-by-3 foot box will take 9 to 14 pounds. No matter what the size, the bin should be 2/3 filled with “fluffed” prepared bedding. For smaller bins, experiment. If you prepare excess bedding, it can be dried, stored and used another time. Your worms will enjoy a mixed diet of vegetable scraps and peelings, food scraps,tea bags, coffee grinds, eggshells crushed egg shells are better on the worms mouth. Lawn trimmings, plant cutting, just about anything organic. However, strongly flavoured foods such as onion, garlic, citrus, vinegar or salted foods should be added sparingly. Also avoid excessive bread, fat and dairy products worms are not fond of GMOZ either. Avoid all Meats (this can smell when rotting and attract vermin! ), Oil, fats or bones, Dairy such as (cheese, milk, yoghurt can also attract vermin), and glossy magazines are not some of their favorites. But hey, they can’t complain! 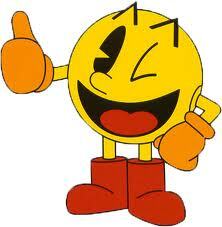 The worms actually eat the bacteria that form on the outside of decomposing organic matter. The smaller the pieces, the greater the surface area on which the worms can feed. Remember, they have little mouths and can’t take big bits. All skins and stems need to be softened by microbial decay before worms can digest them. Chopping and shredding food into smaller pieces speeds up the conversion process. Don’t add too much food at once, as unconsumed food may start to heat up your worm farm and cause it to stink. For every bucketful of scraps added, one can sprinkle a handful of rock powder to help prevent their environment from becoming too acidic. Unlike many pets, worms don’t demand to be fed on schedule. They can’t wear a watch. No arms. LOL They can be fed once a day, every two or three days, or once a week. Just give them your scraps and heir happy. You can even go on vacation for a month without worrying about them. Just be sure to give them enough food before you leave and place plenty of shredded newspaper, cardboard or paperboard on top of the bin and sprinkle a little water. Enjoy your vacation! They will be waiting for you when you get back. And you don’t even have to buy them something. They won’t even know you were gone. How cool is that? Don’t try this with your dog or cat though. All About Worms, Why their Castings are So Good for Plants and Gardens? Castings contain slow release nutrients which are readily available to plants. Castings contain the plant nutrients which are secreted by the worms. They dissolve slowly rather than allowing intermediate nutrient leaching. 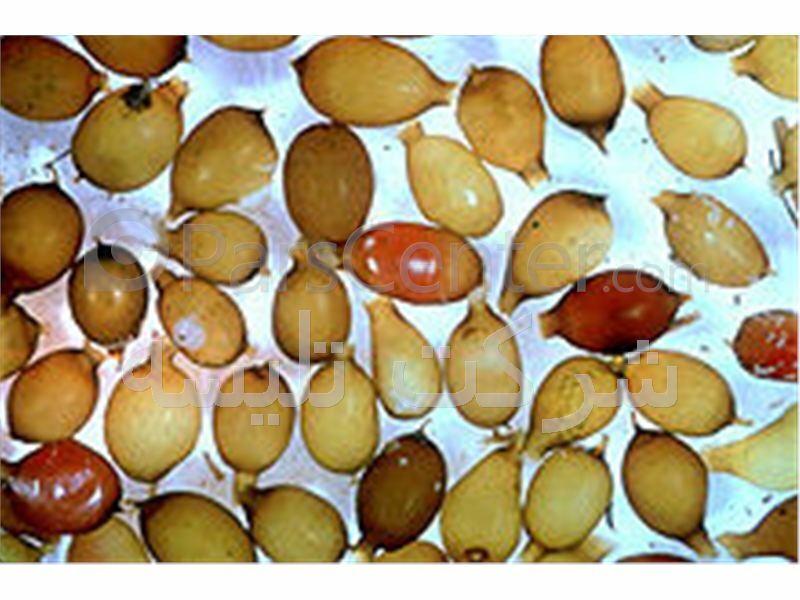 The product has excellent soil structure, porosity, aeration and water retention capabilities. The product can insulate plant roots from extreme temperatures, reduce erosion and control weeds. It is odorless and consists of 100% recycled materials. The activity of the worm’s gut is like a miniature composting tube that mixes, conditions, and inoculates the residues. Moisture, pH, and microbial populations in the gut are favorably maintained for a synergistic relationship, and then a terrific end product. ~Dr. Bill Becker, “The Benefits of Earthworms,” Natural Food and Farming is a great source of information. Worm castings are the best imaginable potting soil for greenhouses or house plants, as well as gardening and farming. Worm castings will not burn even the most delicate plants and all nutrients are water-soluble, making it an immediate plant food. Earthworm castings, in addition to their use as a potting soil, can be used as a mulch so that the minerals leach directly into the ground when watered. The effects of earthworm castings used in any of these ways are immediately visible. They make plants grow fast and strong. Nematodes and diseases will not ruin gardens or plants if the soil is rich enough for them to grow fast. It is the weak plant in poor soil that is destroyed by nematodes and diseases. Red Worm composting (also known as vermicomposting) involves the breakdown of organic wastes via the joint action of worms and microorganisms, although there are often other critters that also lend a hand. The worms do most of the work and fast. 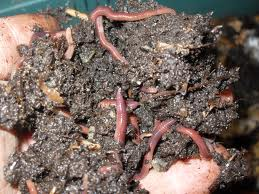 Regular (soil and garden) earthworms cannot be used for worm composting. They will die if added to an indoor worm bin. Also, do not add red worms and earthworms together. They really don’t like each other and the red worms will kill and eat the earth worms. So to maintain peace among the worm worlds, keep them separate. Red Worms eat organic material such as leaf litter from the surface and within 10 inches of the surface. 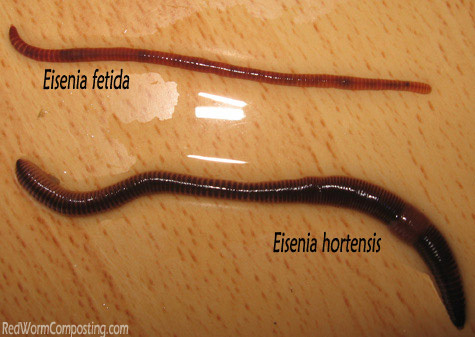 Worms such as Eisenia fetida that prefer living at the surface layer are called “epigeic.” These annelid (segmented) worms have from 80 to 120 segments. Red worms are identified by their alternating red and buff-colored stripes. More than one species of earthworm is called “red worm,” and many are difficult to distinguish without a taxonomic key. Red worms are small, varying in length from nearly 1 1/2 to just over 5 inches (35-130mm), but normally reaching an adult length greater than 2 3/4 inches (70mm). In diameter, mature red worms range from 3 to 5mm. All About Worms, Red Worms that is. YES, Red Worms are the best worm for vermicomposting, but really any worm will do. Red worms want a warm, dark, moist place to live. They thrive in a worm bin when you feed them a variety of chopped up left overs vegetables, coffee grounds, a little fruit, bread. Worms love composted (not fresh) cow manure. While cow is their favorite they also like horse, donkey, llama, and sheep manure. Never use pet droppings! Another way to make them happy is by adding a thin layer of shredded wet newspaper over their food, or soak some cardboard, tear it into small pieces and add it to the top. But really their not picky. We Doowans purchased Red Worms that are used for fishing, (Any Sporting Goods) and they work just fine. We do like to fish, so we have dual purpose worms. And an endless supply of fish bait. What Turns Red Worms Off? Remember, Worms do not like light! Too much ultraviolet light will kill them. Never leave your worm bin or farm in the direct sunlight. It will get to hot for them and they have no way to cool down. Worms do not like heat, which means you should not put them into a hot compost pile either. It will make them sick or even worse. Red Worms do not like a lot of water because they breathe through their skin. Keep them moist, but not wet. They don’t know how to swim. And they can’t wear a life vest either. No Arms! Red Worms do not like meat, cheese, too much citrus fruit and they do not digest tomato seeds as stated above and actually, all the information applies to these Red worms as well. Never feed red worms any sort of domestic animal waste dog, cat or pig. Also, avoid fatty foods, as we all should do. They like most things we like but are not partial to onions, garlic, and leaks etc. They also do not like anything high in acidity, so oranges, tomatoes, grapefruit etc are not suitable for a worm farm or bin, as the increase in acidity can kill them also they just wont eat it! To maintain maximum production, worms need to be kept at 55-75 degrees. Lower or higher temperatures may cause them to slow down, or even die. 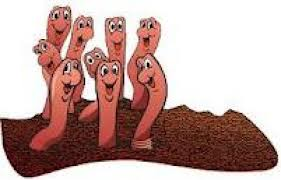 Take good care of your worms and they will multiply, eat your garbage and makes lots of beautiful, odorless, non-toxic vermicompost fertilizer and compost tea. There is evidence that worm tea will cure tomato blight, leaf curl on fruit trees. It can safely replace conventional fertilizers used in areas such as schools, municipal parks and playgrounds where children and pets are of concern. Many conventional fertilizers are unfriendly to the eco-system and are now (or will soon) be banned because of the dangers they pose. 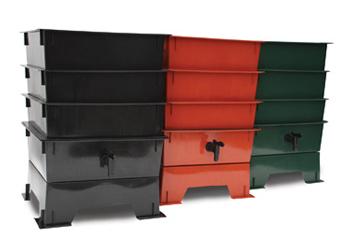 It is widely believed that a composting worm can process the equivalent of it’s own weight in waste each day. Under highly optimum conditions (not likely to be attained with a small home system) red worms have been found to process multiple times their own weight! This is very much dependent on the food stock and how well-managed the system is. Red worms technically graze on the microbial community that colonize waste materials, not really the waste itself (although they certainly ingest some of the rotting waste in the process). Some research has indicated that protozoans are the primary food source, while there is also evidence that fungi and other microbes are consumed as well. There have been a number of research studies indicating that vermicomposting can significantly reduce levels of pathogens in waste materials, such as biosolids. Red worms love (and can tolerate) very high levels of moisture content (80-90%), but they also need oxygen so it’s important to find the right balance. Surface area far more important than depth when it comes to worm bins (ie tubs work much better than buckets) if interested in vermicomposting. The Worm Factory works well. Some people warn that importing earthworms not native to a particular area endangers the local ecology should those earthworms get loose and begin burrowing. This theory is not well-studied and is subject to debate. Ecologists believe earthworms native to northern regions of North America died out during the last ice age, and that species of epigeic earthworm that have naturalized in North America since then, such as the red worm, pose little threat in most areas. Clive A. Edwards, PhD, an earthworm ecologist from Ohio State University, has published information on the effects of exotic earthworms in North America and other regions. Red worms are unlikely to survive freezing temperatures in Minnesota, the region most concerned with damage from non-native earthworm species. 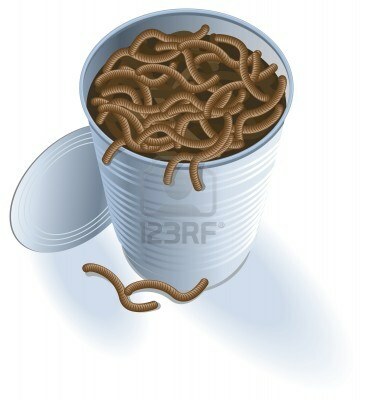 However, people are cautioned not to dump worms, from bait or composting, in the woods. Consult your local extension office to learn the appropriate way to dispose of used worm compost bedding, to avoid spreading possible invasive species. Since red worms eat leaf litter, and some forest ecosystems depend on leaf litter for seed growth, red worms can become a problem in these regions. Which means, we will just have to go fish more often, so really where’s the problem? Now that’s some good eating right there. Oh, we Doowans made this video last summer of our resident Garden Attack Toad Lumpy hunting a worm. It’s pretty amazing and fun for the whole family to watch. He taps his toes to the music. Enjoy! P.S. Lumpy has a sequel Video, Called Lumpy Up Close and Personal. All About Worms and Vermicomposting. You know Worms are people too! Hug your Worm Today! All About Worms, Really, We couldn’t live without them. If some one needs expert view concerning blogging and site-building after that i propose him/her to go to see this web site, Keep up the good work.